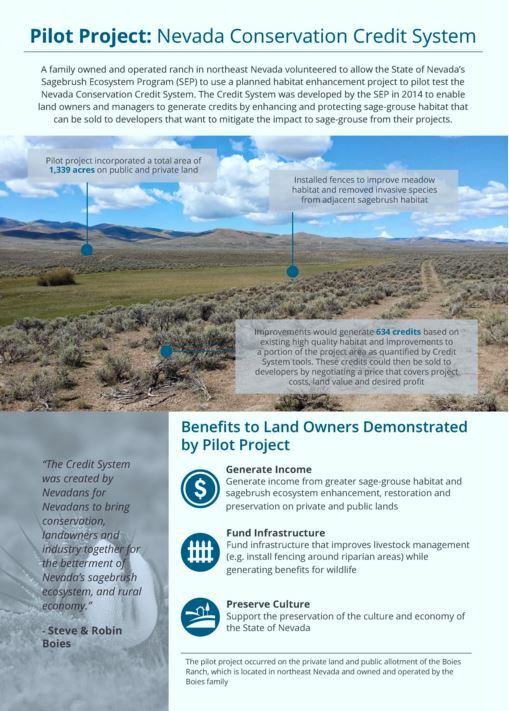 Last week, Nevada Governor Brian Sandoval and Department of the Interior Secretary Sally announced their support for sage-grouse pilot projects on private and public lands through the Nevada Conservation Credit System. With that announcement came an impressive commitment of $2 million to fund the pilots. 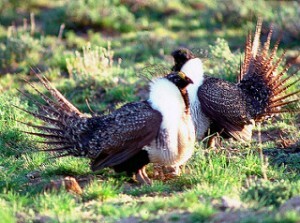 The Nevada Conservation Credit System is now seeking to enroll land managers, namely ranchers, in projects that can earn them new revenue for a variety of conservation activities that improve sage-grouse habitat. The state’s $2 million commitment shows incredible leadership. By investing in solutions for the greater sage-grouse, the state is also investing in Nevada’s agricultural and energy economies. Learn about existing pilots and opportunities to enroll. That’s because this investment will translate into new revenue for landowners to create credit projects – credits that can eventually be sold as mitigation to industry buyers. The expectation is that the pilots will prove to be a financial opportunity for landowners and a faster, more efficient mitigation solution for impact industries. This $2 million will be a catalyst for future investments in the Nevada Conservation Credit System, ensuring success not only for the sage-grouse, but also for Nevada’s rural and industrial economies. Governor Sandoval and Secretary Jewell’s public support for pilot projects was a strong signal from the federal government that the credit system is a valuable approach to conservation. The Nevada Conservation Credit System was modeled off of similar programs, called habitat exchanges, underway in other states. Colorado announced its sage-grouse solution – the Colorado Habitat Exchange – in advance of the September 22 “not warranted” decision. And Wyoming launched the Wyoming Conservation Exchange, hiring a former conservation district manager to administer the exchange. With continued state and federal support, new conservation solutions will continue to gain momentum and expand the conservation marketplace, giving landowners more choices and, ultimately, more opportunity. This entry was posted in ecosystems, Habitat Exchange, Wildlife Protection and tagged conservation credits, environmental defense fund, eric holst, governor sandoval, habitat exchange, Nevada, nevada conservation credit system, pilot projects, sage grouse, sally jewell. Bookmark the permalink. Both comments and trackbacks are currently closed.